Remember a few weeks ago when I wrote part one of our journey and then completely forgot to come back and finish our story? I'm sorry about that. If you forgot about what I'm even talking about you can catch up on our journey HERE. So, the day after Steven and I found out we were expecting, he jumped on a plane for Texas for a four day work trip. That means that I had to sit at home for four whole days and keep this major secret to myself. It was impossibly hard! I couldn't call up my friends to see if they wanted to meet for a drink after work, and I couldn't call my mom to see if she wanted to meet up for dinner because the minute I skipped out on wine the secret would be out. Instead, I sat at home with the dogs pinning endless pins to my secret baby Pinterest boards. Needless to say, it was a very long four days! Steven finally made it back into town late Thursday night. I desperately wanted to drive to my parents house right then and there (11:00pm) and let them know that they were going to be grandparents, but I talked myself down and insisted that I could wait just one more day. Steven and I already had plans to head to Georgia Friday evening to spend the weekend with his family to celebrate his dad and sister's birthdays, but I still had to come up with an excuse to tell my parents that we would be stopping by their house on our way out of town. I told them we wanted to catch up with them, so we were going to stop by for a drink before leaving town. I also told them I had a small gift I wanted to give them. At that very moment, my mom knew what was going on. She started putting everything together (I didn't call her when Steven was out of town, I didn't call her in tears when my monthly visitor arrived, etc. ), and her and my dad anxiously awaited our arrival to see if their hunch was right. The time had finally come! Steven and I made it to my parents house Friday evening (nearly six full days after I received a positive pregnancy test!) with gift in hand. I barely made it through the front door before pushing our gift in their face and willing them to open it. It was obvious that they knew what was going on. My mom started crying before she even opened the package! 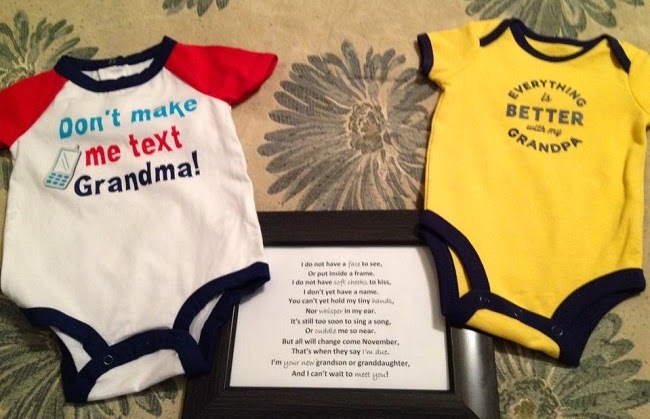 Inside our gift was a framed poem and two onesies, one for the grandmother-to-be and one for the grandfather-to-be! They were beyond excited for us! Tears were shed and hugs were exchanged between us all. It was a moment that I will never forget. After sharing all the details with my parents Steven and I headed out and made our way to Georgia. It was a long drive. We were hoping and praying that we would make it to his parents house before they headed to bed. We couldn't wait another minute to tell them! Thankfully we made it in time. Steven's sister had already made her way into bed, but Steven woke her as soon as we arrived so she could be there when we shared the news. Like we did with my parents, we shoved the gift in their face as soon as we walked in the door and willed them to open it. Like with my parents, inside the gift contained a framed poem with two onesies. Steven's sister also got the same gift with her specialized onesie from the baby. Unlike my parents, however, Steven's family had no idea what they were opening! It helped that Steven had just made it home from a trip (we told them that's where the gifts came from) and also that we were there to celebrate a couple of birthdays. It didn't take long after Steven's dad started reading the poem that everyone figured out what was going on. 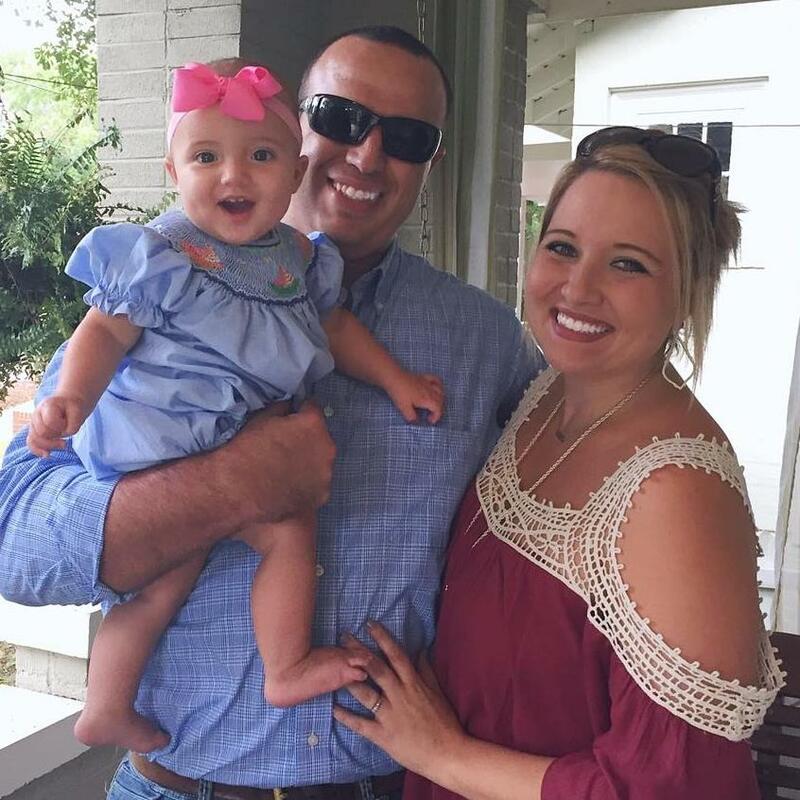 There was a grand baby on the way! More tears were shed and more hugs were exchanged between us all. It was perfect! The next day we facetimed most of Steven's family to tell them the good news. Steven's dad started the conversations by showing each family member what we got him for his birthday.. a little bitty onesie! The reactions on everyone's face was priceless. I wish I had gotten them all on video (we did get the reaction of both sets of future grandparents on video!). With families that live in two different states, Steven and I never thought that we would ever be able to surprise our parents with baby news on the same day. It's pretty amazing how those things work out. We spent the rest of the weekend talking all things baby and anxiously plotting how we would tell our friends and the rest of our family once we made it back to Alabama. First up was our best friends and parents to our sweet Godson. SWEETEST!! so happy for you friend!! Aw I LOVE this! I'm tearing up. Congratulations again! SO sweet!!! I'm not pregnant yet, but already have been thinking about ways to tell my parents! And here I am crying at work. What sweet stories! I can't wait for part three, and then to read about your BabyQ! Love that poem! So Cute! It's so fun sharing this special news, once in a lifetime experience. I'm so happy you could share with both families in person on the same day. I love this and can't wait to read part 3! I am so excited for both of you!!! That poem was super sweet and the onsies are such a fun way to tell them!!! I can't believe you had to hold it in from your parents that many days. It would be so hard!!! How exciting! That poem is too cute! Such sweet gifts! That is such a fun way to tell them the good news !! Can't wait to find out if he or she is a Boy or Girl! LOVE this! So happy for you both! :) Now just to see if baby is a boy or girl!! Ahhhhh! I'm happy you followed up with the rest of the story. I love following along with you and I am beyond excited and happy for you and your (growing) family!